We brought a bike down to track 0 at Suburban Station today to see if we could place a bike on the new Silverliner V train mock up. There are two sets of doors a high platform and a door with a trap for the low platform stations. To the left of the doors were two fold up bench seats which is the wheelchair priority areas. The good news is that a standard sized bicycle can fit in each space fully extended. We are still hopeful that tie-downs will be included in the final design of the railcar as per the 2005 Technical Specifications Document . 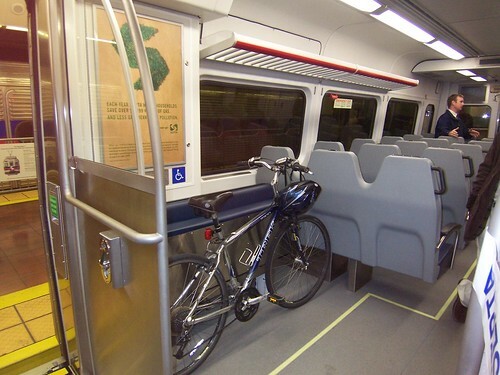 With tie downs and no wheelchairs occupying the space it would be possible to fit 4 bicycles in each rail car. The question is, will the conductors get the people sitting there to move? As it is right now the cunductors will not ask anyone to move for you. I have been turned away from getting on the train quite a few times because the cunductor said someone was sitting in the only bike seat.